Is this One Eyed Shark Real or a Hoax? ﻿ Snap wants to know if this photo of a one eyed shark currently doing the rounds on the internet is real or bull sh*t? 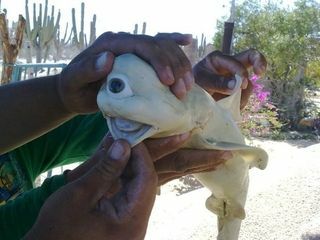 It has been claimed that the picture is a shark fetus found inside an adult female shark caught by commercial shark fishermen in the Sea of Cortez off the coast of Mexico.Initial reports suggested this cyclops shark photo was a hoax, but it seems that there is a possibility that it is in fact real! Certain American fishing media have now reported that a prominent Mexican scientist called Felipe Galvan has said that he had inspected the shark and had even written a scientific paper on the discovery. Apparently the paper is the subject of scientific review before it can be published. As soon as we hear more, we'll let you know whether this one eyed shark story really is Holy Sh*t or Bull Sh*t.
Labels: fishing photo, fishing photography, holy or bull?